A simple and delicious way to dress up cauliflower. Toss cauliflower with dressing; spread onto foil-covered rimmed baking sheet. Bake 25 min. or until tender. Place cauliflower in medium bowl. Add bacon and onions; mix lightly. 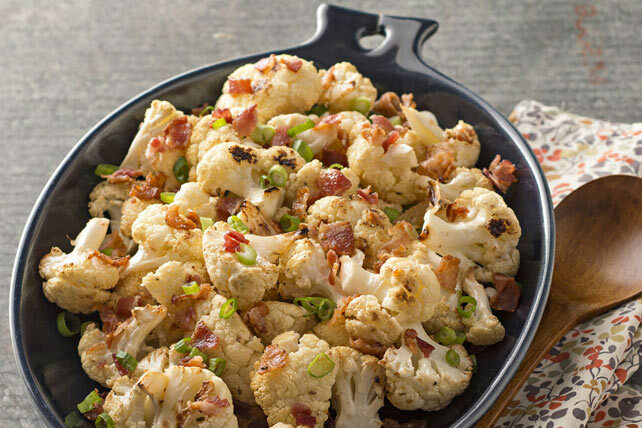 Prepare as directed, omitting the bacon and onions, using Kraft Extra Virgin Olive Oil Italian Sun-Dried Tomato Dressing, and tossing the cooked cauliflower with 1/4 cup chopped fresh basil before serving. Prepare as directed, omitting the bacon and onions, using Kraft Zesty Italian Dressing mixed with 1 tsp. curry powder, and tossing the cooked cauliflower with 1/2 cup each dried cranberries and sliced almonds before serving.